Vegetables & fruits are also pretty important in cavies' diets. However don't introduce too much initially because it may cause diahorrea. It is very difficult for me to say how much vegetable to give since there are various factors involved. How many cavies are there, whether they are used to vegetables, what type of vegetables, the cavies' appetite, etc are some factors that will affect how much you give. Hence its not possible for me to tell you how much. My advice is to start by giving just a bit & slowly increase the amount over time. If there are leftovers after say 2 to 3 hours, chances are they are full & will not eat those leftovers anymore. So use that as a guide as to how much they can eat. 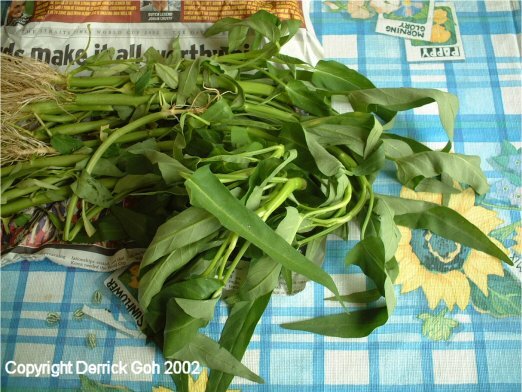 Vegetables & fruits in Singapore tend to have pesticides sprayed on them. 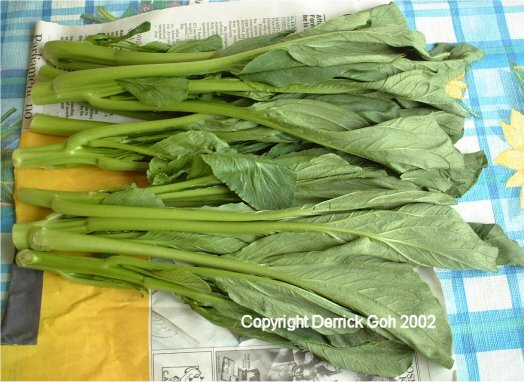 Soak leafy vegetables in water for at least 1 hour. For other vegetables like carrots or cucumbers, give the skin a good rub. Do not use those chemicals that supposedly remove dirt & pesticide. For your info, the vegetables I often give my cavies are marked with an asterisk * beside them. Too much carrots supposedly affect the cavy's liver, so don't give too much & too often. Spinach is high in oxalic acid which is said to upset the cavy's digestive system, so limit the amount given. Vegetables that are high in water content like lettuce should also not be given too often & twice a week should suffice. Cabbage supposedly causes gas & bloat so limit the amount & frequency. Celery veins (those stringy things along the sides of celery) should be removed 'cos those are choking hazards. Although peas are fine, I am worried they get choked so I recommend halving the pea, silly as it may sound. You should also avoid vegetables with white sap for example bitter gourd & brinjal. The white sap from cucumber is fine although I do prefer to rub two pieces together & then wash away the sap. Experiment around with various vegetables. Different cavies will have their preferences so it depends on what your's like & whether you can afford it. Mine refuse to take bell peppers, tomato, cilantro & even parsley. Spoilt brats! There are many types of lettuce & even though all are safe for cavies, iceberg lettuce must be fed with caution 'cos it contains the most water & too much may result in diahorrea. Some places don't label their lettuce but as long as its a round head of lettuce, chances are it is iceberg. If its longish or leafy, then its not. Romaine lettuce is ideal 'cos it contains less water. Two other unique lettuce I've seen are red coral & green oak. Red coral lettuce is dark purple in colour while green oak lettuce doesn't really look like lettuce, so if not for the label I wouldn't know it was indeed a lettuce. 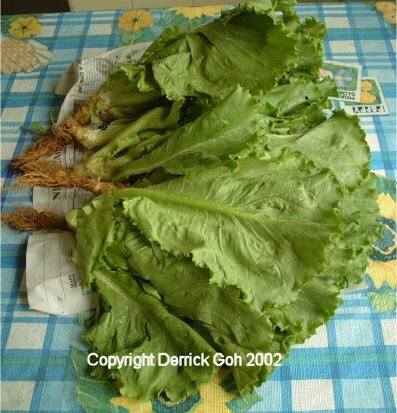 Not everyone can afford green oak lettuce which retails at NTUC for $17 per 100 gm (ouch!!). In fact some even find romaine lettuce costly. So most resort to iceberg. 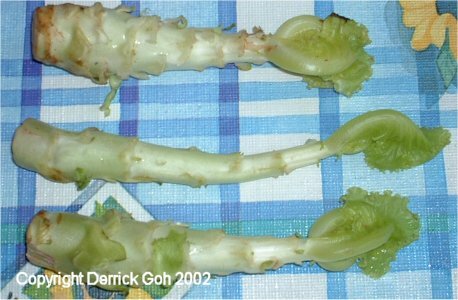 I would recommend what some call "local lettuce" which is the long leafy type you often see in fishball noodles. Those are not as expensive I believe. However they tend to contain lots of sand so soak very well. Some of you may not be familiar with some of the local vegetables named above. Therefore I will try to post pics of them & hopefully you have a better idea of what I mean. Some of these vegetables had their pic taken before they were soaked in water & hence may look a little wilted. Always soak for at least an hour to get rid of pesticide/dirt/sand also to refresh the veggies. This is what the centre of the local lettuce looks like after removing the leaves. It can be eaten too. Fruits, like vegetables, will provide your cavies with vitamin C & fibre. It also provides variety in their food. The list below is only a rough guide. Like humans, cavies also have different tastes. If you're unsure if the vegetable or fruit is lethal to cavies, play safe & don't feed it to them. But as a general guide, avoid stuff that is too acidic e.g. lemon, lime, grapefruit & anything too exotic like durians! Some people give fruit skins but I advise against doing this unless they're really scrubbed well to remove pesticide & wax. Some cavies get mouth sores from acidic fruits like apples, grapes, kiwi, etc. so be on the look out. Fruits that are high in water content like watermelon should not be given too often & twice a week should suffice. For melons, I suggest you do not give the entire slice due to high water content. About 2 cm of flesh plus the rind will do. You should remove all hard seeds e.g. from cherries, apples, papaya, etc. These can be a choking hazard for cavies & is why I prefer cutting fruits for them rather than throwing in the entire thing whole. Banana is known to cause bloat so go easy & do not give the skin. Avocado is high in fat so go easy too. It is difficult to say what is the ideal amount of fruit or veg 'cos it depends on how many cavies you have, their age & general health. Thus you have to use your judgement. However you should keep in mind that it is always better NOT to overfeed. If the amount of veg or fruit given to them is less than the "ideal amount", nothing terrible is going to happen to them. But if you overfeed & they get diahorrea, then that is terrible & I should know 'cos I lost a cavy due to complications resulting from diahorrea. It is up to you whether you want to feed vegetables only, fruits only or a combination of both. I prefer feeding vegetables only 'cos I believe they contain more fibre than fruits. Besides, fruits are usually sweet & may attract ants. However I do give my cavies some fruits like watermelon rinds, pears or Asian pears occasionally. Asian pears are sometimes also called Chinese pears or fragrant pears. It is called "Lai" in Teochew / Hokkien or "Li Zhi" in Mandarin. I tried apple once but only Fe Fe nibbled at it & even then it wasn't for long. Lastly, this is off topic but just for your knowledge & interest. If I remember my primary 3 Science correctly, anything which contains seeds is considered a fruit. So things like chilli, bell pepper & I guess cucumber, are actually fruits. Go figure! Herbs are fine to give cavies but be sure to give only those that are not toxic to them. I've to admit I'm not very knowledgable in this field so better to check with a vet or experienced breeder. Stuff like parsley, mint & oregano are definitely okay. Fresh herbs are obviously better than dried ones however your selection can be limited, not to mention costly. I've seen packs of dried mint at Pet Lovers Centre Thomson Plaza for about $6 for a small pack. Kind of costly if you consider a bag of 12 huge alfalfa cubes costs the same price! Worst of all, you don't know if your furball will actually eat it. You could try splitting the cost with pals so that if your cavy doesn't eat it, at least you don't waste the full $6. Oxbow has quite a variety of dried herbs in packs but I've yet to see those here yet. As far as grass goes, grass should NOT be given to cavies 'cos they tend to get contaminated very easily by vehicle exhaust, animal pee, filthy humans who spit & worst of all chemicals when the pest busters do their fogging. And besides, not all types of grass are safe for cavies. 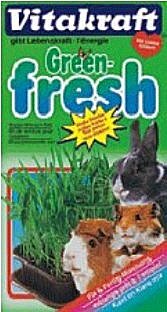 So if you live on landed property & have your own garden which you are 100% sure is safe from contaminants, then bring a sample of the grass to a vet or experienced breeder to check if its safe for cavies. Many kinds of leaves & flowers are toxic to cavies so don't even think about it. Branches are not a great idea for chewing due to the contamination factor as well as the fact that you don't know what tree it came from. Some woods contain aromatic oils which can be deadly to cavies. Therefore wooden sticks or branches are a big no no! If you really want to try grass, give them Vitakraft Green Fresh (pictured below). Its a grow-it-yourself grass & since I've never used it, I don't know how tough it is to grow! But I wouldn't feed too much of it initially. This is 'cos most cavies are used to a dry diet of hay & pellets, with the exception of some vegetables or fruits. Introducing too much grass suddenly may give them diahorrea. So go easy!